Tool (dashboard tamplates) in MS Excel - are professional, dynamic and simply adjustable management reports (dashboard templates) helping you to efficiently present your data, support oversight over your business’ processes and your decision-making. 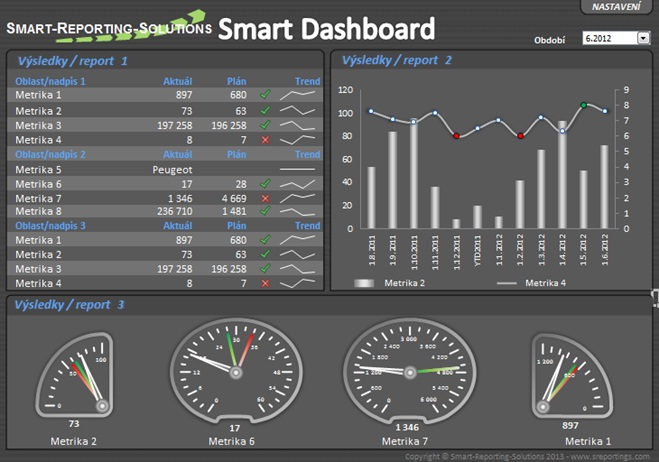 Smart dashboard products are automated to the maximum extent possible so that you can efficiently conduct business analysis and compose reports. - Professional and clear graphical layout. - Simple setup of dashboard parameters (metrics, periods, data and plans) - no excel skills needed. - Dynamic views based on user-defined parametres. - Modern-looking graphs (speedometers, thermometers, trends) for perfect visualization of the outcome.